► Still the benchmark sports car? 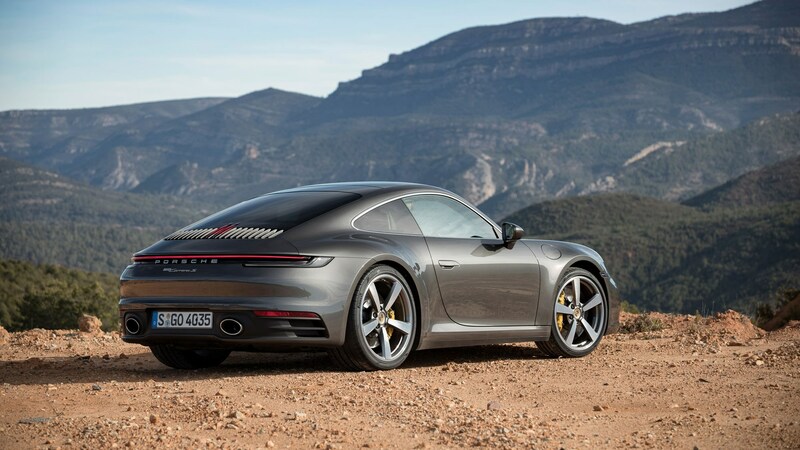 At a glance the new 992-generation Porsche 911 doesn’t look like a new 911. That, you could argue, means Porsche has failed. Porsche would argue the opposite is true. Modern without being vogueish, relevant while also standing apart – these are the contradictions at the heart of the 911’s unique appeal, not to mention its longevity and rampant success. This most evergreen of sports cars has been on sale uninterrupted for 55 years, don't forget. 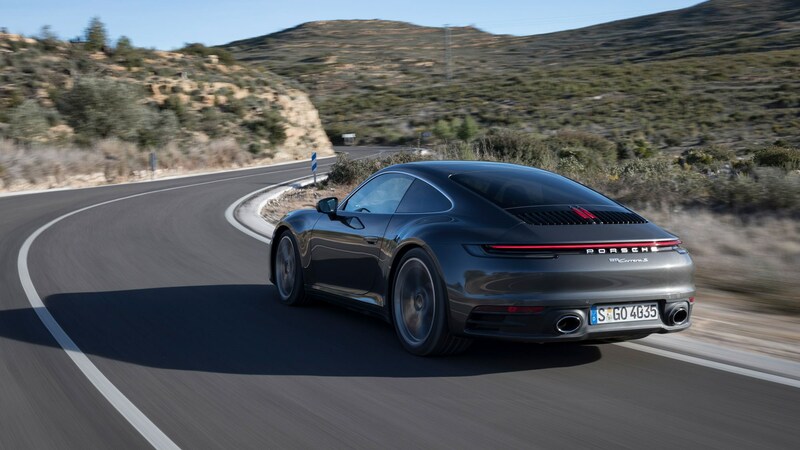 And so to the 992-generation car, which at once debuts a dizzying raft of technology, from electronically controlled turbo wastegates to frameless floating instrument displays, wet modes to thermal imaging night vision, but that also gleefully pinches design influences from its past. 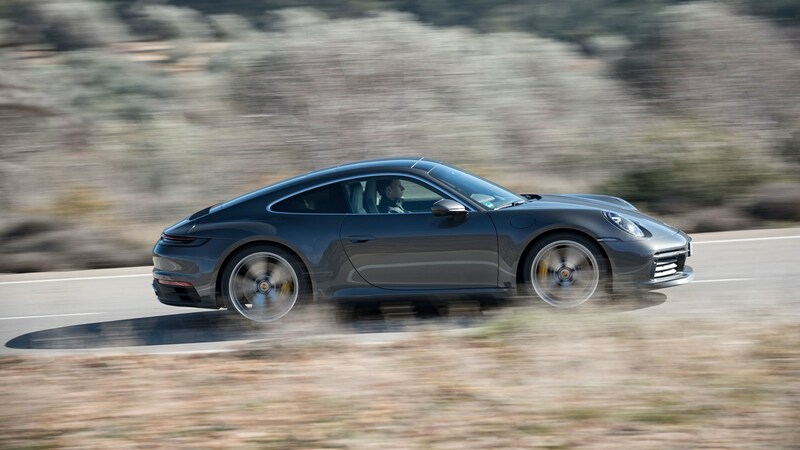 Undoubtedly more complex and advanced than the outgoing 991.2, is the new car actually better? And by a margin that makes any material difference? Let’s find out. 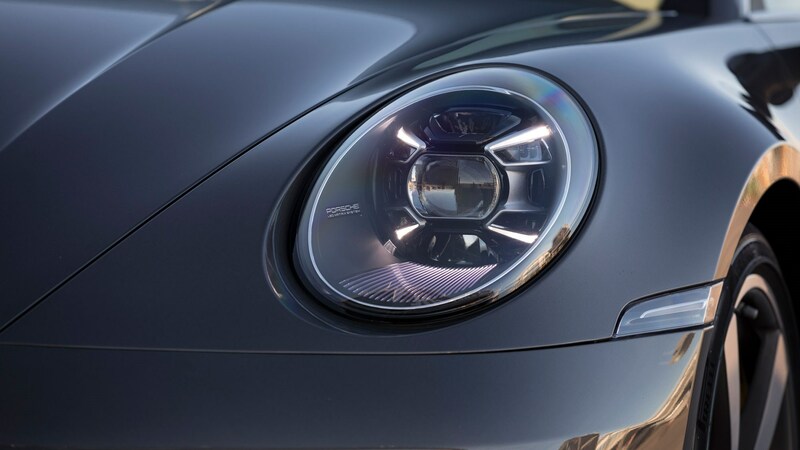 Only Porsche would engineer an all-new bodyshell – primarily now in aluminium (70%), a 911 first (the 991’s was 37% aluminium) – great swathes of the world’s population can’t tell apart from the old one, but it’s lighter, stiffer and, to these eyes at least, prettier (rear aspect excluded), and gets even better looking when you open the door and drop inside. The new seats are slimmer, lighter, set lower and comfier. They are, effectively, perfect. The driving position is the same. And, in the right spec, the 911 now boasts a genuinely gorgeous interior for the first time that I can recall. The super-simple dash and cabin architecture is concept-car cool and minimal, with bold, uncluttered horizontals, a smart gloss black centre console, an ace row of military looking toggle switches for functions like stability control and hazard lights (unrelated, obviously…) and the striking new driver’s instruments, which flank the bold analogue rev counter with digital displays. 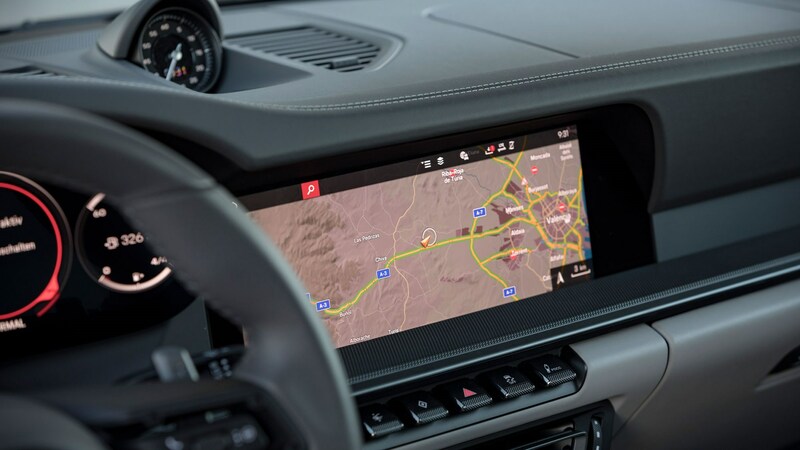 These offer a range of functionality, from a thermal imaging forward feed to a nav map, and go some way toward mitigating the 992’s lack of a head-up display. The new cockpit design gives the 992 a chameleon-like split personality; choose dark greys and metal finishes for a techy vibe, or throw in some wood and oxblood leather for something achingly cool and retro. So, it’s nice in here. Does it work? Broadly, yes. The Sport Chrono pack’s drive mode controller is a step backwards. Toggling between modes, you now have to keep an eye on the display rather than simply choosing from modes marked on the control. And let’s not even get started on the ‘motorsport inspired’ 20-second full everything powertrain nonsense. 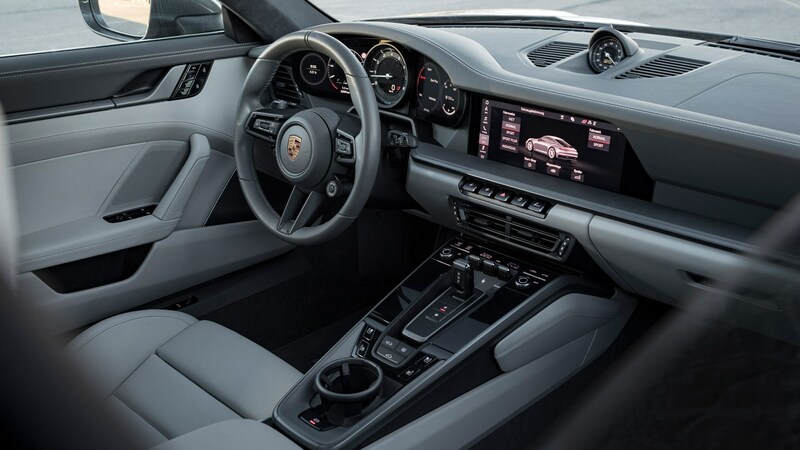 While the main interface is a touchscreen, with all the compromises that implies (especially in a sports car), it is at least a handsome, crisp and responsive touchscreen (smart too, enlarging tiles and offering options as your finger approached), and one that plays no small part in the 911’s newfound interior calm and classiness. No manual gear lever? It’s coming, but not for 12 months, so for now it’s PDK only. Our man Georg Kacher has tried the manual though, and while the seven-speeder is improved, it’s still not as good as it should be – let alone as good as the GT cars’ six-speeder. Can we get moving now please? Absolutely – but are you prepared for just how quickly we’re now able to get moving? The 991 Carreras weren’t slow cars but the 992 shifts. Select Drive and manual shifting for the (now eight-speed) PDK box and pop her into Sport or Sport Plus: mash it. First 391lb ft and then 444bhp almost instantaneously get to work on those huge new 21-inch wheels and, in the Carrera S with the Sport Chrono pack, 62mph comes up in just 3.5sec. The similarly equipped 4S will do it in 3.4sec. It’s all just numbers, sure, but be in no doubt: base 911 performance has gone up a notch. On the road it’s an ever-present ally, this new engine, forever ready with convincing drive and always dusting your progress with turbo noises like whooshing turbines, fluttering wastegates and sonorous moans. More responsive than before? Perhaps, a touch, and this flat-six certainly feels more comfortable and smooth at lower revs, despite the higher compression ratio – perhaps a result of the new asymmetrical valve actuation, employed here to create swirl and improve fuel/air mixing at lower engine speeds. Detail engine upgrades, then, though the performance lift over the outgoing S is significant and, coupled with the new eight-speed gearbox (with a shorter first and seventh and eighth as overdrives effectively), the new powertrain is almost impossible to catch out. On tortuous Spanish hill roads it thuds out of hairpins, gently over-rotating even warm P Zero Pirellis on a brush of throttle, before yelping from 4000rpm to just north of 7000rpm (the redline starts at 7400rpm; the limiter’s at 7500) in a spectacular display of drivability and simple, apparently effortless power. It even sounds quite good, if nothing like as good as recent non-turbo sixes, inevitably. Too much engine for the chassis? Not a bit of it, thankfully, though at first, as you put in some motorway miles to get to the good stuff, you’re worried Zuffenhausen accidentally built a GT. After all, the cabin now feels too slick and plush for a mere sports car, and the ride’s so impressively pliant – even on a 21-inch rear wheel, and with the more purposeful optional 10mm suspension drop – that you worry the 911’s gone soft. (The impressive ride is due in part to the lower pressures the bigger rear tyres can run, together with a new generation of adaptive damper). Leave the Drive Mode in Normal and the PDK box will also do its level best to hide the engine’s power, always reaching for the tallest possible ratio like a kid stretching for what it knows it can’t have. It’s quiet in here, too; really quiet. The smart new wing mirrors generate next to no turbulence, and even the roar of those huge rear tyres is well suppressed. Days at the wheel? You could do weeks in here, and still not want to get out. Oh, and there's a new Wet mode too, for trickier conditions. But the sports car is in there. Find some space, nudge into Sport, manual and the slacker Sport stability programme, go. The new powertrain piles on speed in a heartbeat (overtaking is child’s play), and soon you’re running into tight hairpins and fiendish little sequences at quite a rate. The brakes – ceramics on the 4S we tested, steels on the S, and with a more direct ratio and bigger rear discs on both – are supremely strong and feelsome, and able to handle it all, from walking pace town stuff to serious, speed-slaughtering stops. Get into the first few corners and you can’t help but feel you’ve accidentally been handed a not-yet-unveiled GTS (it’ll surely come) wearing the wrong badges. Front track width is up, boosting front-end grip and confidence, and the rack is quicker – now just 2.5 turns lock-to-lock, albeit with a variable rate on our Power Steering Plus-equipped test car (£185). And while grip at both ends is improved, it’s at the front that you really feel it, that telepathic, reassuringly accurate wheel delivering a change of direction from a front axle zealous in its dedication to catering for your every whim. So you lean on it harder and harder, running optimistic entry speeds with nothing more complicated than a lift of the throttle and a roll of the wheel – and you’re through and gone. But the 992 hasn’t forgotten how to be a 911. It still feels uniquely centre-pivoted, and its balance and attitude are still hardwired to wheel and pedals in that uniquely satisfying 911 way, the car delighted to be rotated on the brakes (in the dry, understeer barely enters the equation on the road, and is progressive and easily mitigated on track), ferociously grippy through the turn and blessed with so much corner-exit grip a clean exit is always an option (as is a less clean, slightly more fun one…). So it handles. 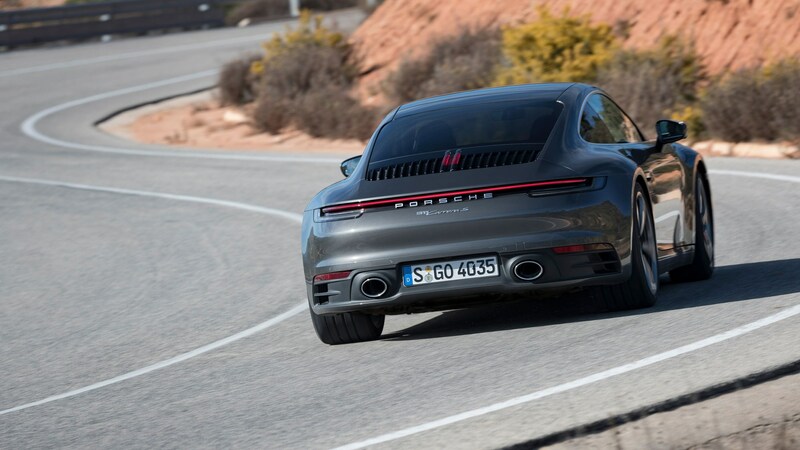 Almost more impressive is that the 992 does so while never feeling in any way digital or synthetic – a miracle given the myriad systems involved, from the optional rear-wheel steering (£1592) to adaptive dampers (standard – the 10mm lower Sport set-up is £665), active anti-roll bars (PDDC, optional, £2273) to a torque-vectoring diff (standard). The net result is a car of such towering ability and appeal that it effectively broadens its remit. You could cover hundreds of miles cross-country without really trying, using the Porsche as a Very Good Normal Car. But it’s also so rewarding to thrash you’ll be up early and out every summer Sunday morning just to feel it do its thing one more time. There’s got to be something wrong with it? Agreed, though the advantage of developing the same car for half a century is surely a product that can’t help but be good by now – and the 992 is good. But its engine could sound better, certainly, the touchscreen interface could be more intuitive, less cluttered and less obtuse (there’s so much going on even the Home screen can’t show all the main functions at once – you have to scroll down through a column of them), the steering could be brighter and a little lighter, the voice recognition system could work full-stop, and the rear end could be better looking. It could also have a manual gearbox option from launch, and a really good six-speeder in place of the compromised seven-speed it will get. It could also be cheaper too, of course (lay into those options and it’s easy to skip over £100k – we’ll drill into which ones you really need in the near future). But if this all sounds a little like nit-picking there’s a good reason for that. Perhaps the most amazing thing about Porsche’s 911 is that so few choose to directly challenge it. Who doesn’t want a pretty, fairly practical £95k coupe able to be pretty much anything you’d like it to be; feelgood daily, track tool, special GT or an enviably bold family car set to become part of the family? All but unchallenged, Porsche could have phoned-in the 992.